Milutin Milankovi&cacute; was a polymath – a civil engineer, professor of applied mathematics, climatologist, and populizer of science who produced a robust mathematical explanation of recurring ice ages and climate change on our planet. He demonstrated how the earth’s orbital cycles result in ongoing changes to the amount of energy our planet receives from the sun, leading to climate change. These cycles of astronomy-related climate changes on Earth are now known as Milankovitch cycles. Milankovi&cacute; also produced the first scientifically supportable climate predictions for conditions on the solar system’s other rocky planets. 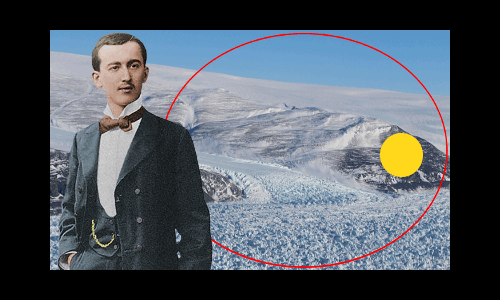 Between 1912 and 1940, Milutin Milankovi&cacute; revived the solar radiation theory of climate change and ice ages advanced by James Croll in the 1860s. Croll’s theory, which was not mathematically rigorous, had been abandoned. The fundamental laws Milankovi&cacute; drew on for his calculations were those of irradiation and celestial mechanics. Milankovi&cacute; calculated the effects of Earth’s orbital cycles on insolation. In other words he showed how our planet’s orbital cycles of eccentricity (100,000-year cycle), axial tilt (41,000-year cycle), and precession (23,000-year cycle) determine the amount of energy Earth receives from the sun. Having established in detail how insolation varies with time, he showed how Earth’s climate runs in sync with insolation, leading to climate change and ice ages. As a practical basis for his calculations, Milankovi&cacute; used Wladimir Köppen’s conclusion that unusually cool summers rather than unusually cool winters lead to ice ages. In cool summers, ice lingers for longer than usual, reflecting away the sun’s heat, leading to further cooling. Milankovi&cacute; concluded that the Northern Hemisphere is probably most important in determining the earth’s climate, since two-thirds of the earth’s land area is there. Milankovi&cacute;’s work was at first accepted. Then, like Croll’s, it was abandoned by mainstream science. In 1955, Cesare Emiliani found that Milankovi&cacute;’s climate cycles were in sync with the ratio of oxygen-16 and oxygen-18 isotopes in ocean sediment cores. Harold Urey had shown that these isotopes are markers for temperature. Geologists continued to reject Milankovi&cacute;’s cycles, claiming Emiliani’s results were just a coincidence. In 1976, James Hays, John Imbrie, and Nicholas Shackleton published Variations in the Earth’s orbit: Pacemaker of the ice ages in Science. The authors verified Milankovi&cacute;’s cycles conclusively. They found using ocean sediment cores that changes in climate over the last 450,000 years – specifically growth of ice sheets in high latitudes – are in sync with Earth’s orbital variations. Milankovi&cacute;’s work was once again accepted. Milankovitch cycles are named in his honor. Milutin Milankovi&cacute; was born along with his twin sister on May 28, 1879, in the village of Dalj, in the Austro-Hungarian Empire. The village is now in Croatia. Milutin’s father, Milan, was a businessman and local politician. His mother was Jelisaveta, née Muačevi&cacute;. The family was prosperous and featured several prominent citizens, including a grandfather who was a published philosopher, an uncle who was head of the Serbian Army, and a design engineer. As a result of his frequent poor health, Milutin was often educated at home by his parents, relatives, and family friends. His father died when Milutin was eight, and he was raised by his mother, grandmother, and uncle. Milutin Milankovi&cacute; completed secondary school in 1896, age 17, then studied Civil Engineering at the Vienna University of Technology. He graduated with high distinction in 1902, age 23. After a year’s compulsory service in the army, Milankovi&cacute; returned to Vienna’s University of Technology as a graduate student. His thesis on pressure curves, an important topic in construction engineering, led to him being awarded a PhD in December 1904, age 25. After getting his PhD, Milankovi&cacute; worked as a highly successful civil engineer. His reputation and fees grew rapidly. In the fall of 1909, he accepted the post of Professor of Applied Mathematics at the University of Belgrade. In this role he divided his time between academia and civil engineering consultancy work. In 1912, Milankovi&cacute; began exploring the relationship between astronomy and our planet’s climate. He considered the effect of insolation (the total energy reaching the earth from the sun) on climate, relating insolation to our planet’s different climatic zones. In 1914, he published a paper considering astronomical effects on ice ages. On July 28 1914, World War 1 began. Milankovi&cacute;, a Serbian, was arrested and interned by the Austro-Hungarian authorities. His wife Kristina traveled to Vienna’s University of Technology where she explained Milankovi&cacute;’s plight to his old professor and friend Emanuel Czuber. Czuber had considerable influence and he obtained Milankovi&cacute;’s release from the internment camp. Milankovi&cacute; was given permission to work in Budapest, which he did for almost the whole four years of the war. He calculated the effects of the sun’s energy on the solar system’s planets and their atmospheres. In 1916, he published his paper Investigation of the climate of the planet Mars. Milankovi&cacute;’s paper featured a solar radiation curve. The curve was used by Alfred Wegener and Wladimir Köppen in their 1924 book The Climates of the Geological Past, hence Milankovi&cacute;’s name and work became more widely known. Milankovi&cacute;’s Solar Radiation Curve shows the amount of solar radiation received by Earth for the last 190,000 Years. The curve was shown in Wegener and Köppen’s 1924 book The Climates of the Geological Past. “The main results of this work were obtained, as its basic programmatic idea demanded, from Newton’s law of gravitation and from the law of irradiation, without taking recourse to any hypothesis. Serbia issued a stamp in 2004 to commemorate Milankovi&cacute;’s 125th birthday. In June 1914, Milankovi&cacute; married Kristina Topuzovi&cacute;. They had one son, Vasko, born in 1915. In 1919, with World War 1 over, Milankovi&cacute; returned to Belgrade with his family. He spent the rest of his life there. In 1941, Nazi Germany invaded Yugoslavia, occupying Belgrade. Milankovi&cacute; retreated to his home and concentrated on writing. He resumed his work as a university professor when the war ended, retiring from his professorship in 1955, age 76. Milutin Milankovi&cacute; died age 79 on December 12, 1958 in Belgrade. He was buried at the New Cemetery in Belgrade. "Milutin Milankovi&cacute;." Famous Scientists. famousscientists.org. 31 Mar. 2018. Web.